Shortly after Virgin America reported losses for 4Q2012, FY2012 and 1Q2013 the carrier added to its list of customer accolades by winning the top spot in customer satisfaction from Consumer Reports. It is a pattern that has been repeated throughout the carrier’s six-year existence – constant praise for its innovative customer service and equally continuous elusive profits. During the last year Virgin America has made changes that it hopes will reverse its string of losses including slowing its growth, reworking its network to withstand seasonal troughs and attaining relief on some of its debts. Even as the changes are largely in their infancy, sceptics are right to question the carrier’s staying power and how Virgin America fits into the mature US market place. 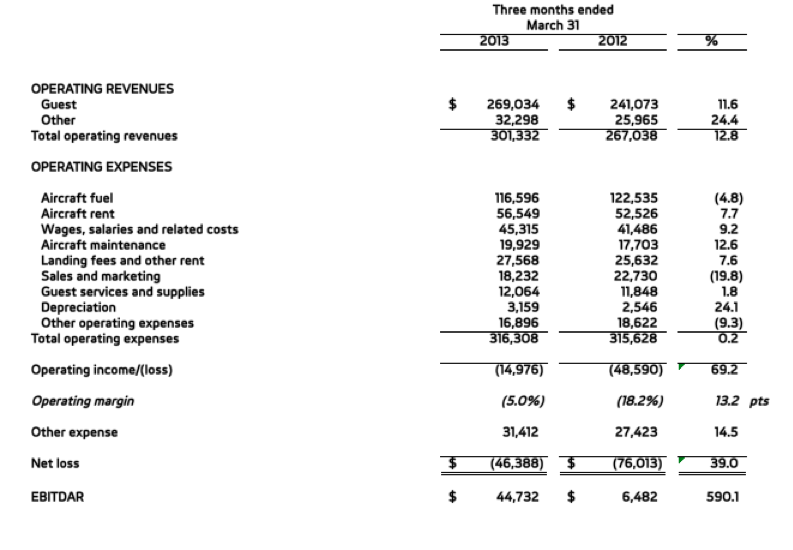 Behind Virgin America’s 4Q2012 loss of USD25 million, a FY2012 USD145 million loss and the USD46 million it bled during 1Q2013 were some slight financial improvements including its first 4Q operating profit of USD5 million in 4Q2012 and 18% growth year-on-year in its unit revenues during 1Q2013. But the unit revenue growth was driven by a 4% capacity decline during 1Q2013 that was achieved partially through a 17% reduction in daily aircraft utilisation, which helped lift Virgin America’s unit costs 8% year-on-year. Virgin America’s average USD201 fare during 1Q2013 was however substantially higher than the USD162 recorded by fellow hybrid carrier JetBlue and the USD152 average fare garnered by Southwest during 1Q2013. The costs creep triggered by less capacity, a decrease in aircraft utilisation and fewer passengers carried did little to help Virgin America on its trajectory to profitability, but the airline did improve its operating loss during 1Q2013 by 69% to USD15 million and narrowed its net loss by 39% to USD46 million. While those are solid improvements, the overall performance does little to engender confidence that Virgin America will deliver on promised profitability. Virgin America ended 1Q2013 with USD58 million in cash, based on data collected by the US Bureau of Transportation Statistics (BTS). 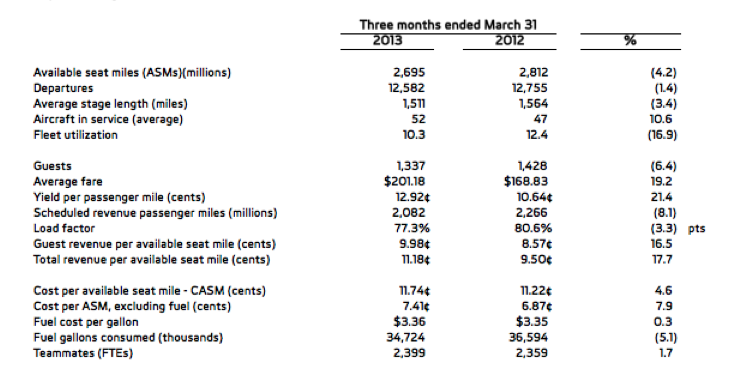 Virgin America’s cash balances peaked at USD160 million during 4Q2011, and dipped to USD26 million during 4Q2012. Given Virgin America’s relatively low cash balances it is not surprising it cancelled orders for 20 Airbus narrowbodies and deferred deliveries of 30 single-aisle jets. 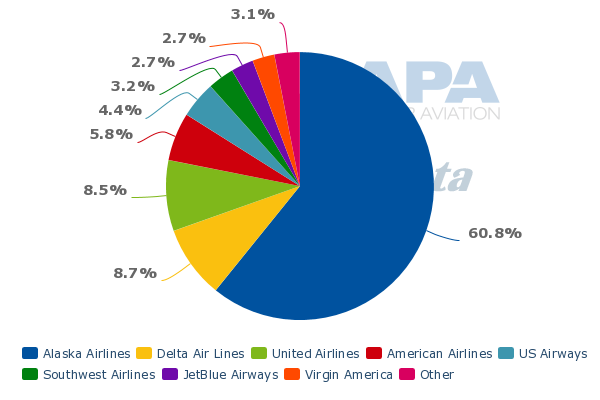 The cash on hand at Virgin America as of 31-March-2013 is about 12% of the USD483 million ultra low-cost carrier Spirit had on hand at that time. While the argument can be made that Spirit has had the benefit of an initial public offering, the carrier stresses it has turned annual profits since transitioning its ultra low-cost model since 2007, which was four years before its 2011 initial public offering. Spirit is experiencing a different paradox as it ranked at the bottom of the latest Consumer Reports airline rankings. Its strategy of offering the lowest fare and then charging for every other aspect of the journey garners a lot of negative attention in the mainstream press. But the reality for the majority of passengers is that price still reigns supreme as they make air travel decisions. Even though Spirit’s bare bones product may be unpopular, the carrier has continued to turn strong profits, growing its net income grew approximately 30% year-on-year during 1Q2103 with a fleet of 49 Airbus A320 family narrowbodies. On a fleet basis Virgin America’s 53 Airbus narrowbodies make it similar in size to Spirit, yet Virgin America continues to sustain losses. Virgin America in reporting its latest financial results detailed agreements it had reached with investors to de-leverage its balance sheet through the elimination of USD250 million in debt as of 31-Dec-2012 and roughly USD20 million in accrued interest recorded during 1Q2013. The airline reasons that if the balance sheet restructuring had been in place at the start of 1Q2013, its net loss would have been cut by USD20 million. The carrier has also closed on USD75 million in debt financing, which coupled with the other relief Virgin America has received from investors allows the carrier to cut its interest expense during 2H2013 to USD20 million, which Virgin America estimates is one-third of the interest expense it recorded during 2H2012. Company CEO David Cush stated the carrier’s moves to improve its balance sheet is a first step in modifying its capital structure to "one more in line with public companies”. Virgin America has deliberated openly during the last couple of years about going public, but the carrier could encounter bemusement from would-be investors over the exact nature of the carrier’s investment thesis. Unlike Spirit, which targets low-yielding passengers that are no longer of interest to legacy airlines, Virgin America competes directly with full-service carriers with the calculus that its lower fares but high service levels including a cheaper first class cabin will lure passengers away from network carriers. While Virgin America has cancelled few routes since its launch, its financial performance shows that legacy carriers take any entrenchment seriously, and will use their larger scale to ensure their passengers do not jump to Virgin America. During 1Q2013 Virgin America’s load factor fell 3ppt year-over-year to 77% driven by a drop-off in passengers carried. It is tough for an airline like Virgin America to aptly compete with a legacy carrier that has greater scale to undercut a competitor’s pricing for extended periods. The latest example is United lobbing on frequencies and lowering fares after Virgin America entered the Newark-San Francisco/Los Angeles markets. United has estimated that fares in those markets have dropped as much as 20%, and warned the pricing degradation would affect its 2Q2013 performance. While the race to the bottom in terms of fares is a boon for consumers, it does little to help Virgin America’s efforts to reach profitability as its top-line expenses continue to outpace costs, triggering negative operating margins. During 1Q2013 the nearly 13% increase in top-line revenues recorded by Virgin America to USD301 million was lower than the USD318 million the carrier logged in operating expenses. Even as top-line expenses remained essentially flat year-over-year during 1Q2013, the type of competitive pressure Virgin America faces and is exhibiting in Newark shows that it has a tough climb in getting its revenue to surpass expenses. Another challenge Virgin America faces is it doesn’t have the network strength of other hybrid carriers such as Alaska or JetBlue. Alaska has leveraged its commanding position in Seattle to forge partnerships that boost its revenue and JetBlue has executed the same strategy at New York JFK. The problem is United is the dominant carrier at Virgin America’s San Francisco base and headquarters. Even though Virgin America has partnered with numerous carriers, the lack of scale it has compared with Alaska in Seattle and JetBlue in JFK means its revenue opportunities are limited. 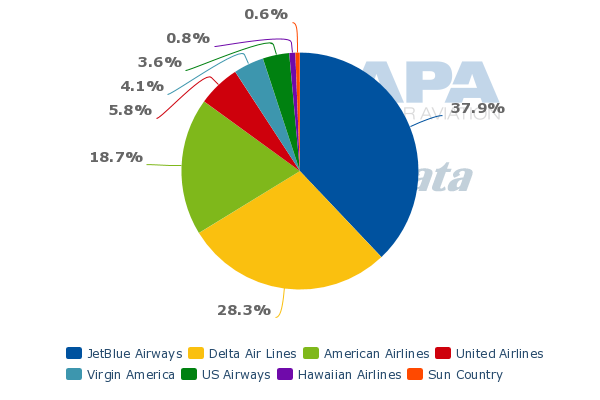 Current schedules in Innovata show that Alaska represents 61% of the US domestic seats on offer from Seattle, while JetBlue accounts for a 38% share at JFK. 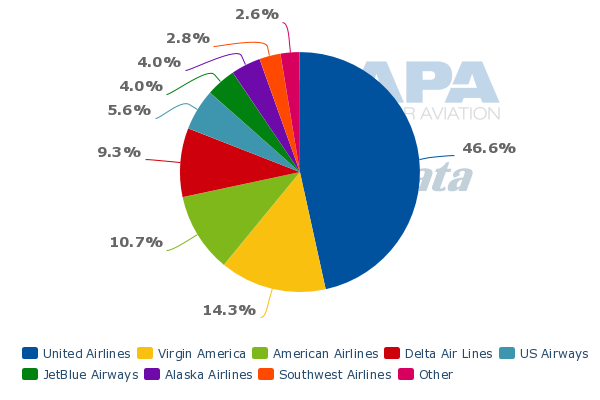 In San Francisco, which is United fourth’s largest hub based on seats deployed, Virgin America has just a 14% share of domestic seats compared with United 47% share. Mr Cush predicts Virgin America’s latest moves to shore-up its balance sheet, aircraft cancellations and deferrals announced during 2012 will help the carrier record a net profit during 2H2013 and put the airline on sound financial footing in 2014. Given the carrier has made similar predictions in the past that have yet to materialise, a healthy level of scepticism about future profitability is natural. Even if Virgin America overcomes significant hurdles to achieve profitability, its place in markets that will soon feature three network carriers, a major low-cost carrier, two strong hybrid airlines and an ultra low-cost carrier remains uncertain as its financial position and network strategy are murky at best.